1. Both the CPJ and the IFJ come across to me as sober and honest organisations. Though they use different methodologies and therefore come up with different figures their articles on deaths of journalists in Russia and elsewhere impress me as well researched and well intentioned. I can see no agenda other than a desire to protect and increase the safety of journalists. 2. Though they use different methodologies and come up with different figures both the CPJ and the IFJ say about Russia essentially the same thing, which is that the situation there with respect to the safety of journalists is improving and that the Russian authorities are making a genuine effort to come to grips with the problem and that this effort is starting to achieve success. “Russia and Mexico, two of the world’s most murderous countries for the press, are heading in different directions in combating deadly anti press violence. 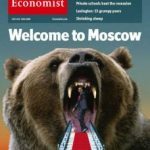 The Committee to Protect Journalists found improvement in Russia as journalist murders ebbed and prosecutors obtained two high profile convictions”. By contrast the CJP reports that the situation in Mexico is going rapidly from bad to worse. 4. As it happens if you follow the methodology of the CJP (which is considered more rigorous and more authoritative) then the improvement in Russia in recent years becomes even more marked. The CJP reports no journalist killed in Russia for journalistic activities in 2010 and only one journalist, Khadzimurad Kamalov, killed in Russia in 2011. 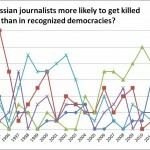 It reports no journalist killed in Russia so far this year. Moreover five of the last six journalists killed in Russia were killed in the northern Caucasus, which as is well known is a war zone and is therefore especially dangerous for journalists (as are for example Syria, Iraq and Afghanistan). The remaining sixth case, which is the only case of the last six cases to have involved a journalist killed for her journalistic activities in Russia outside the northern Caucasus, is that of Anastasia Baburova, who was killed in Moscow on 19th January 2009 when she left a press conference in the company of the human rights lawyer Stanislav Markelov, who was also killed in the same attack. Baburova’s and Markelov’s case has been solved with a young couple, Nikita Tikhonov and Yevgenia Khasis, having confessed to and been convicted for the crime. 5. I would add that of the 77 journalists the CPJ lists as having been killed most probably for their journalistic activities since 1991, 27 or more than one third of the total were killed in the northern Caucasus. Of the remaining 50, there is good reason to think that Politkovskaya’s murder, though happening in Moscow, was also connected to the war in the northern Caucasus with the authorities accusing a Chechen gunman of having been the person who actually shot her. This may also be true of some of the other murders of journalists that have happened outside the northern Caucasus. Moreover as I have said the CPJ’s latest figures show that the proportion of Russian journalists who have been killed in the northern Caucasus is now increasing to the point where the CPJ says that five out of the last six were killed there. Of these five one, Estemirova, appears to have had her case solved with the authorities tracing the murder weapon and the car in which she was killed to a jihadi warlord who was himself killed in an air strike. 6. Of earlier cases, there are now good grounds to think that the Politkovskaya case has been solved, with several people now confessing to their part in her murder and with the trial of her murderers pending probably in the autumn. There are also suggestions that the same group that was responsible for the murder of Politkovskaya was also responsible for the earlier murder of the Russian American journalist Paul Khlebnikov, in which case this case too may shortly be solved. However against this there have been a number of prosecutions that have failed because juries have rejected cases brought against persons the authorities say have murdered journalists. Some of these jury decisions may be because of genuine doubts about these cases and or because of the traditional suspicion many Russians have towards the police and the prosecuting authorities. However the IFJ in its report strongly hints that some of these acquittals have been due to the suborning of juries either by bribery or intimidation. The IFJ is urging the Russian authorities to take action to remedy the problem. 7. I also have some doubts about whether some of the cases listed even in the more rigorous CJP survey really are murders. The case of Ivan Safronov, a military journalist who was criticised for leaking classified information and who is the seventh most recent case in the CPJ’s list, looks to me like a suicide. The earlier and more famous case of the Novaya Gazeta deputy editor Yuri Shchekochikin, though more suspicious, could be simply a case of a violent allergic reaction to medication provided to deal with a bad case of flu. 8. 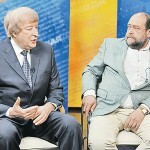 In summary, what the facts show is that after a disastrous period lasting from the end of Communism to the end of Putin’s first term, the situation in Russia in terms of journalists’ safety has now improved to the point where outside the war zone of the northern Caucasus journalists where special conditions apply, journalists are now no more likely to be murdered in Russia for their work than they are in many western countries. 9. I would again point out that murders of journalists are by no means unknown in western countries. In my previous comment I mentioned the unsolved murder in Britain of the BBC journalist Jill Dando who was shot dead apparently by a contract killer outside her house in 1999. The CPJ also lists six journalists killed for their journalistic activities in the United States since 1993 with several cases unsolved and with several clearly bearing the hallmarks of contract killings. One was one a prominent Spanish speaking journalist who was killed in New York because of his work exposing Columbian drugs cartels. The CPJ report on his killing mentions that death threats continued to be sent to his newspaper for some time after his murder. Another cases, seemingly still unsolved, involves a Haitian born journalist who was killed in 1993 in Miami. The CJP report on his killing mentions that two other Haitian born journalists were also killed in Miami the previous year and are not therefore included amongst the six US journalists listed as having been killed after 1993. It seems that these two previous murders and that of the Haitian journalist killed in 1993 may be connected and might have been revenge attacks carried out by supporters of the ousted Haitian President Jean Baptiste Aristide. Lastly the CJP reports one killing of a US journalist who was shot in the street but whose case the US authorities treat as “unexplained” in a way that would certainly trigger charges of a cover up if it were to happen in Russia. 10. Lastly, I would point out that whilst there has not been a single case of a journalist whose murder in Russia has been securely linked to the government, there have been numerous cases of journalists whose murders were almost certainly due to opponents of the government. Those journalists killed in the northern Caucasus by Chechen or jihadi terrorists obviously fall into that category. I would also point out viz KF’s reference to the recent “Anatomy of a Protest” documentary on NTV that the most recent case in Russia of violence against journalists was the beating up of two NTV journalists by opposition supporters during the opposition protest and riot on 6th May 2012.